Technology advances at unbelievable speed. Human culture develops at a slower pace. For instance, agencies frequently try and promote something on social media that seems like a can’t-miss winner—until the tweets and re-tweets start coming in. 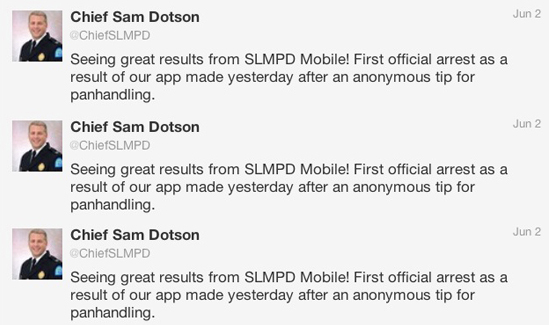 In St. Louis, Chief Sam Dotson recently took to social media to promote his agency’s first pan-handling arrest made via the social media app. But instead of being impressed, people the response went the other way. Which is, of course, what Twitter is for. It has yet to sink in in some quarters but Facebook, Twitter, and all the rest are essentially two-way radios. That’s the nice thing about old-timey press releases. They don’t give every wizenheimer with a bone a microphone and an audience.